PubCrawl | Downtown Sault Ste. Marie, Michigan! New Holland Brewing Company of Holland, Michigan has returned to Sault Ste. Marie, Michigan for the second year as the presenting sponsor of the eastern Upper Peninsula’s largest pub crawl. The I-500 Pub Crawl presented by New Holland Brewing Company features 16 locations in and around Downtown Sault Ste. Marie, as well as at the I-500 race track itself. Isaac Hartman from New Holland Brewing Company was excited to announce the Brewery’s support of the Pub Crawl again this year, as well as for the I-500 Race and other events that take place during the weekend. The I-500 Pub Crawl fits New Holland Brewing Company’s vision of making a difference in local communities and in events that enhance beer tourism. 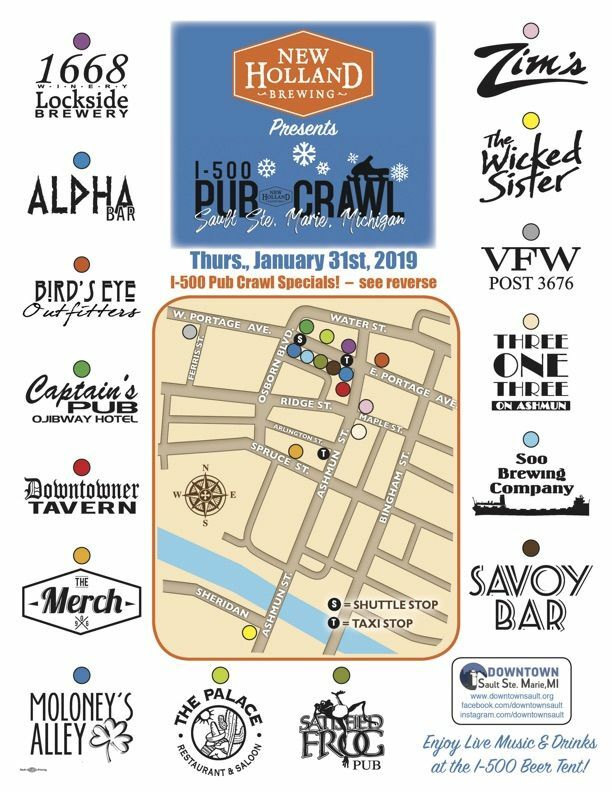 This year, pub crawlers can sample a number of New Holland products on tap at participating locations, including The Cabin Fever brown ale, The Mad Hatter IPA, and the Tangerine Space Machine. New Holland Brewing Company is a 100% Michigan owned company distributing to 38 states, four countries and employs over 400 people . The Downtown Development Authority, in coordination with downtown bar owners, is encouraging customers to drink responsibly and coordinate a designated driver. Taxi and Lyft service is available.